A sixty years traditions in this filed, excellent design, maximum care in the selection of materials, great production knowledge and attention in every single particular are secret of Arlati for the achievement of maximum quality levels. Every Arlati chandelier is designed and manufactured to the highest standards for beauty and durability, using the finest materials available. 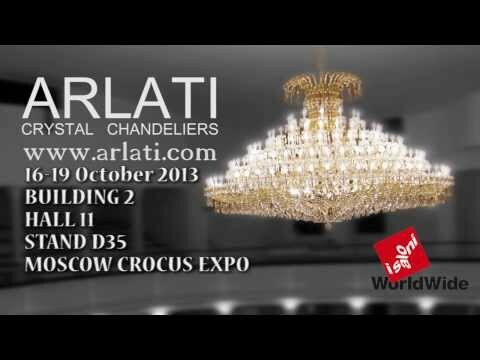 To better satisfy your exigencies of elegance and quality, Arlati dress their chandeliers with the best crystals available on International markets. SCHOLER CRYSTAL® for the pressed, half-cut, cut and lead crystals. SWAROVSKY ELEMENTS® for the Elements line. Arlati's production is mainly based on the classical "Maria Theresa" style Chandeliers, dedicated to the Austrian Empress. Many great chandeliers have been commissioned to Arlati, measuring up to eleven/twelve meters, with 800-1000 lights, designed and created for foreign markets and special projects such for as churches, theatres, big hotels and palaces, temples, mosques... all around the world!